The Emerson P150 thermostat is a 5-2 day programmable thermostat that allows you set convenient weekday and weekend schedules. This thermostat is compatible with most single stage heating, cooling and heat pump (without aux) systems. 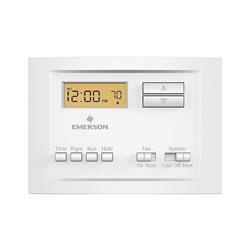 This thermostat features backlit display and precise temperature control of plus/minus 1°F. Not compatible with heat pumps with aux, electric baseboard heat, and some other systems.